Lowdown: A detective, a murder mystery, and a world whose civilization is about to end through an incoming asteroid. Crime detective stories are a rarity for me, mainly due to that perceived Agatha Christie syndrome: that feeling that I never had the chance to identify the killer based on the information the author has been gracing me with. The Last Policeman offered an edge that seems worthy of me giving it the read despite it being a detective story. It features more than your ordinary murder mystery. The recently promoted Detective Palace is sent to write off an obvious suicide case in a world filled with similarly staged suicides. What everybody around automatically deduces to be an open and shut case stinks in our detective’s eyes. He decides, against all advice, to start investigating the matter as a suspected murder case. Oh, there is a catch too: Henry lives in a modern day USA that, like the rest of the world, is about to be wiped out by an asteroid that came out of nowhere to devastate human civilization as we know it. As our detective struggles on through one lie after the other in his investigations, the world around him falls apart. Motivation for anything is understandably lacking when the world comes with an expiry date, thus Palace’s biggest challenge is not the investigation itself but rather the post apocalypse settings of the pre apocalypse he’s in. Ultimately, the question that’s asked is what’s the point? Is the investigation worth its admission price? The Last Policeman delivers on several fronts. Its crime mystery element is superb, with multiple well developed characters so well woven together that even the distractions are interesting. Between the investigation, the personal issues and the world coming apart, the whole affair reads and feels like film noir. The setting is modern, the premises is heavily science fictional, but the package is unmistakably film noir. Then there are the philosophical questions raised by The Last Policeman. The question of what’s the point of it all is an old one, but revisiting it in this time limited world created by the book sheds new light (or rather, new shadows) on the equation. After all, we are all Detective Palaces. We are all on this earth for a limited time, and ultimately everything we do will be undone, so what is the point? What reason do we have to do the things we do and to make an effort? I will gave you Detective Palace’s answer, even if it is not explicitly stated in the book: because doing the right thing matters. 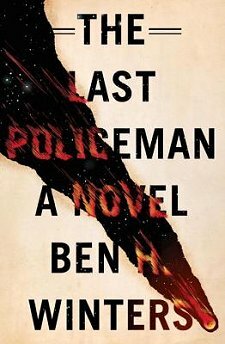 Overall: More than a bit of a morbid read but rewarding nevertheless, The Last Policeman manages to make 4 out of 5 stars. I've never heard of this book. Sounds interesting. It was favorably reviewed at Boing Boing. Then the ebook price went from $10 to $3.50 and they mentioned it again, so I gave it a go. well, it's back to 10 now. Obviously, they did it just so I could have a window of opportunity to give their book a favorable review. Either that or it was a Christmas special.